Manila, Philippines – The list of passers and full results of March 2019 Licensure Exam for Teachers (LET) for Elementary and Secondary levels are expected to be released by the Professional Regulation Commission (PRC) Board of Professional Teachers thirty-eight (38) working days after the administration of exams. March 2019 LET results also include the top 10 examinees, top performing schools, performance summary of colleges and universities as well as important announcements on initial registration, oath-taking among others. The 2019 LET was conducted by PRC Board of Professional Teachers headed by its Chairman, Dr. Rosita L. Navarro, Vice Chairman Dr. Paz I. Lucido, and its members Dr. Paraluman R. Giron and Dr. Nora M. Uy. The first schedule of board exam for Teachers was administered on March 24, 2019 at PRC testing centers in Manila, Baguio, Cagayan de Oro, Catarman, Cebu, Cotabato, Davao, General Santos City, Iloilo, Legazpi, Lucena, Occidental Mindoro, Pagadian, Pampanga, Romblon, Pangasinan, Tacloban, Tuguegarao and Zamboanga. To pass the LET 2019, PRC said that an examinee must obtain an average rating of not less than 75% and must have no rating lower than 50% in any of the tests. PRC, in its official Resolution No. 1127 series of 2018 entitled "Schedule of Licensure Examination for Year 2019" said that the LET Passers March 2019 for elementary and secondary levels will be posted on May 21, 2019 (Tuesday) or thirty-eight (38) working days after the last day of licensure examinations. The computed days are with respect to declared regular holidays on April 9, 2019 (Araw ng Kagitingan), April 18, 2019 (Maundy Thursday), April 19, 2019 (Good Friday) and May 1, 2019 (Labor Day). Meanwhile, official results of LET may also be released earlier or later than the target date without prior notice. LET or Teachers board exam is currently the program with most number of examinees being administered by PRC. In the most recent LET conducted on September 2018, 18,409 elementary teachers out of 90,750 examinees (20.29%) and 60,803 secondary teachers out of 126,582 examinees (48.03%) passed. Francis Dave Perez Cabanting from University of Southeastern Philippines in Davao City and Samuel John Estenor Parreño from University of Mindanao - Digos College shared the top spot in September 2018 LET - Secondary level having 92.80% rating. The complete list of top examinees are itemized here. In the elementary level, Rhea Joy Yes Genson from University of Southeastern Philippines from Davao City and Mariel Cataluña Saladaga from University of Southeastern Philippines - Tagum ranked first having 89.80%. Complete list of topnotchers for elementary level are posted here. In the list of best performing schools for LET September 2018, University of Santo Tomas ranked first in elementary level having an overall passing rate of 86.78%. In secondary level was University of the Philippines - Diliman having 94.19%. Complete list of schools' performances here. 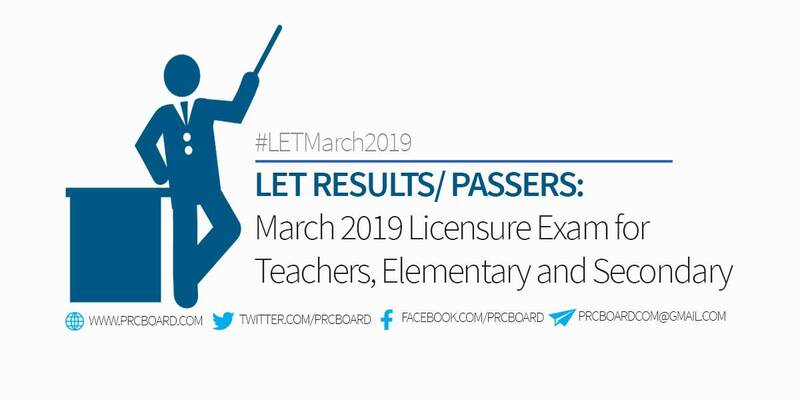 To receive up-to-date news on LET or Teachers board exam results for March 2019, we advise our visitors to bookmark this page, visit PRC official website or follow us at our social media pages via Facebook and Twitter.